The brand new design Water Wagon from OZ Turners is constructed from all high quality components to give users years of maintenance free service. The new water wagon from OZ Turners features a 5300L poly water tank, a 5hp Honday water pump and a 1.5" hose with female camlock at the discharge end. The Oz Turners Water Wagon is easily connected to an OZ Turner compost turner to supply it with the water required for the composting process as it moves along. 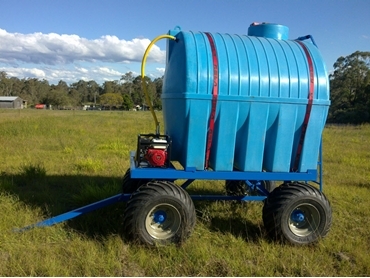 These water wagon can also act as mobile water supply systems for any agricultural device that requires a powerful supply of water.